An SSD can read and write data many times faster than the best mechanical hard drive. On the downside, flash memory is many times more expensive than the innards of a typical hard drive, so manufacturers have limited their SSD capacities to hit reasonable price points: A 128GB SSD costs about $130, and for that same price tag, you can buy a 3.5-inch desktop hard drive that delivers 2TB of storage, or a 2.5-inch laptop drive that provides 1TB of storage. Two years ago, Seagate (quickly followed by Samsung) introduced a drive that married a small SSD with a mechanical drive. The objective was to deliver the superior speed of an expensive SSD, while retaining the higher capacity and lower cost of a conventional hard drive. Now that Toshiba and Western Digital are joining the party, it's a great time to explain in more detail what hybrid drives are and how they operate. Hybrid drives work much in the same way as the current dual-technology configurations in many gaming and power-user PCs, as well as some ultraportable laptops. Such systems have a small, discrete SSD to hold the operating system and frequently used data, augmented by a more capacious conventional hard drive for less frequently accessed data and large collections of documents and digital media. Current hybrid drive designs, in contrast, deliver both technologies within a single physical unit, and they employ software caching algorithms (rather than relying on the user's brain) to decide which data belongs on the SSD portion and what goes on the drive’s platters. These caching algorithms reside in the hybrid drive's firmware, not the device driver. To the computer’s operating system, a hybrid drive appears as a single unit with the SSD portion acting strictly as a large cache. The cache is nonvolatile, so the data doesn't disappear when power is absent. You can find several hybrid designs on the market, but the most common is a 2.5-inch version meant for laptops, Seagate's Momentus XT SSHD. Seagate refers to the caching logic it uses on the Momentus XT drives as Adaptive Memory technology. The thinner 7mm, 2.5-inch drives that Toshiba and Western Digital recently announced are destined for Ultrabooks. They will likely use similar technologies with similarly suitable names, although either company might opt to skip caching and produce a dual SSD/hard drive in a single physical package. In any case, a caching algorithm will track the files you load the most often (operating system files, applications, and the like), and store them on the SSD portion of the drive. From that point on, these files will load into memory much faster than they did from the mechanical drive, although some overhead will be involved as the computer determines whether the file in question resides on the SSD. No caching will have occurred the first time you use a hybrid drive, so its initial performance will be the same as that of a mechanical hard drive, but the speed will increase over time. To test a current implementation and to determine how much improvement you can expect over the long term, we ran a special version of WorldBench 7 six times using a 750GB Seagate Momentus XT hybrid drive with its 8GB internal SSD. The WorldBench 7 score for Seagate's Momentus XT hybrid drive indicates that it's a little faster than a conventional hard drive, but much slower than a true SSD. Over the course of the six runs, system boot times dropped from 35 seconds to 31 seconds, and the WorldBench 7 score rose from 112 to 116. That's about a 12 percent improvement in boot times, and a 4 percent jump in WorldBench. However, the WorldBench 7 score of a nonhybrid, 5400-rpm drive also climbed by 4 percent—most likely due to Windows 7's own caching technologies. The standard drive showed no decrease in boot times, so the current Seagate hybrid drives do offer some benefit. WorldBench 7 measures application performance, not the load times of the applications themselves, though subjectively the load times seemed only slightly faster after the first pass in my hands-on tests when I eliminated the Windows prefetch and swap file. Let's call that further, marginal evidence that a hybrid can make a positive difference in your everyday computing. 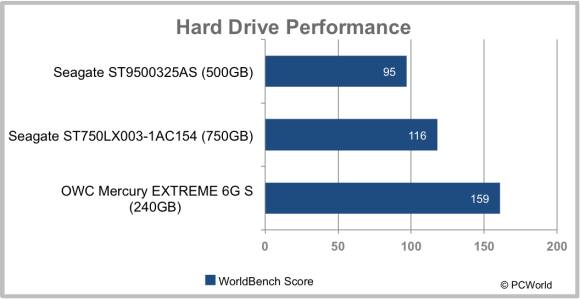 Just for comparison's sake, a good SSD scored more than 40 points higher on WorldBench 7 on the same system. The specs for the upcoming Toshiba and Western Digital hybrid drives weren't available at the time of this writing; however, you might see models with 16GB or even 32GB SSD portions that provide a greater increase in performance. The larger the SSD in the hybrid drive, the more data you can cache and the less often you'll need to load data from the hybrid’s slower mechanical drive. Integration and interaction with operating systems could also boost hybrid performance, assuming of course that a significant drop in SSD prices doesn't render the technology moot. As of October 10, 2012, a standard 750GB, 2.5-inch hard drive was about $80, a 750GB Momentus XT SSHD was about $130, and a brand-name 128GB SSD also cost about $130. Given those prices, current hybrid drives really make sense only in laptops, and only when you want high performance and more storage capacity than an SSD can provide. In a desktop PC with unoccupied drive bays, you'll get much better bang for your buck with a stand-alone SSD combined with one or more mechanical hard drives. Even for a laptop, a smaller, more affordable SSD supplemented by an external conventional hard drive might better deliver the performance and the capacity you're looking for.